In response to authorities announcing a preliminary investigation, Lyoness has suspended investment from Italy. Late last month the Italian Antitrust and Consumer Protection authority revealed it had begun a preliminary investigation into Lyoness’ business activities. Within forty-eight hours of news of the AGCM’s investigation breaking, Lyoness informed Italian affiliates it was suspending its voucher investment scheme. With this Communication we inform that no consumer who is taking part or will take part in the Lyconet Marketing Program will be able to order Discount Vouchers or Limited Edition Discount Vouchers. In particular, the Company informs that in consideration of the upgrading of the Lyconet Marketing Program, the purchase of Discount Vouchers and Limited Edition Discount Vouchers for marketers wishing to take part in the Lyconet Marketing Program will not be temporarily possible. Recall that access to the Lyconet Marketing Program is free. 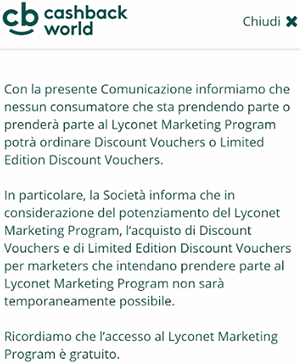 Originally “accounting units“, today Lyoness orchestrates its Ponzi scheme through “discount vouchers“. Tellingly, Lyoness don’t inform their affiliates as to why they’ve suspended voucher investment. The irrelevant shopping cashback side of Lyoness will still operate in Italy. Without the Ponzi side of the business to hold it up though, expect a sharp downturn in Italian Lyoness activity. Which ultimately could spell disaster for Lyoness as a whole. Alexa currently estimate that Italy makes up just under half of website traffic to the Lyoness website. Come on Oz, we know that this is just haters hating and this is nothing. I know because xuxa said so. You can bet this news is going to slow down recruiting in Italy. Wonder if they will have to cancel some upcoming seminars because of this news? Time for xuxa to come and defend this in 1, 2, 3…..
Oh totally. Lyoness is still open for business in Italy and this is all fake news. I can’t find any proof of the total suspension of Discount voucher selling in that market. And it’s very strange a Lyconet information being held by Cashback World. Personally, if it’s something not perfectly synced with the Italian law, I am not shocked. Italia it’s a completely mess in courts. Lyoness == Lyconet == Cashback World. We’ve provided a copy of the notice shown to Italian Lyoness affiliates. You’d have to ask Lyoness why they didn’t address shutting down the Ponzi scheme in Italy with the rest of the affiliate-base. xuxa, Right on cue, though a little late with your post. I really expected you to post within 24 hours not wait 48 to do so. But as usual the same BS all Ponzi pimps post when their Ponzi de Jour gets in trouble with the authorities. Next you will be telling us that the haters wrote the letter to the authorities, not Lyconet/Cashback World. But thanks for the comedic relief. I needed a good laugh today. As I suspected this is a fake new. If you want to make up nonsense provide a source, else spambin. Oz, if I recall , the way the world works it’s in the other way around. You have to prove your allegations when you accuse someone of something. No the other way around. If you can provide proofs (and a print with low resolution it’s not a proof ) of the company that we are talking it’s not legal I am SURE you will turn out a famous lawyer in Europe. I just wondering what is the motivation of people like you guy’s to insist in something like this company with 15 years when you have companys like IML that are a clear SCAN. You have to prove your allegations when you accuse someone of something. Proof has been provided by way of a screenshot of the Lyoness backoffice message. If you want to create a fictional alternative narrative you provide your own evidence. Kthxbai. A low resolution print screen from a unknown source it’s not (in a normal World ) a proof that sustain a shutdown theory regarding a multi national company running for 15 years with 47 offices. The source is Lyoness’ Italian backoffice. Look, if you’re just going to deny without any further evidence, that’s cool. I’ll be marking anything further from you that doesn’t contain supporting evidence as spam. Xuxa better just concentrate on getting the turnips to market. Playing the ponzis like Lyoness just not their thing. Understood you are a rube but can we at least spell “haters” right…. I cannot tell if its – again – possible to order vouchers…. AFAIK you had to log in to the Italian backoffice to see the message. You don’t need to log in. It shows the pop up window only the first time you visit the site. If you want it to show again, delete all the cookies from lyoness websites and try again. Anyone can tell me how a brand like MotoGP can be related to this Ponzi scheme Cashback World? Cashback World pay MotoGP money to sponsor. That seems to be the extent of their partnership. Legitimacy by association is bs, so take it for what it is – a marketing ploy. Lyoness is a scam on the market since a decade now. One of the main scammers is Oliver Bösch, who is responsible for several frauds in Europe. He was one of the leading salespeople of Lyoness with a network of 3 million people he states in his presentations! Having a long track criminal record, he also tries to be a professional poker player! All his stolen money he loses at those tournaments from Vienna to Vegas… Stay away from this scammer. The final Court Judgement from Austria has confirmed that Lyoness is indeed a PYRAMID scheme! E s are in favor of Lyoness injured already denominated in repayment of deposits, numerous court decisions. Not only does Lyoness have to pay all the capital, but interest rates of 4% – well above the bank interest rate – and replace the costs of the legal proceedings. But also in extrajudicial way repayments for the majority of the victims could be obtained. In the meantime, Lyoness has repayments of more than € 1 million to injured parties, not least in view of the pressure of an investigation carried out at the Economic and Corruption Prosecutor’s Office. If you desire to redeem your deposits with Lyoness, Lyoness will pretend to have learned of your dissatisfaction by writing and announce that you must wait at least 4 weeks to respond to your recovery because your request needs to be scrutinized. If a repayment will not be rejected anyway with a stereotypical reference to the terms and conditions, Lyoness offers experience – unjustified – only a modest partial payment.